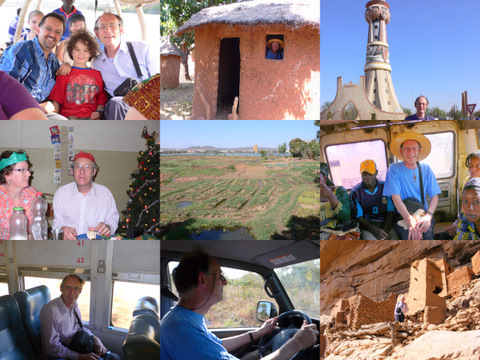 Adventures in West Africa with Rob & Lois » Blog Archive » Clive’s Best Bits! My good friend Clive Rahn visited for Christmas and had a whale of a time! 1. A New Year’s Day boat trip on the Niger River. 2. Visiting the village of Koura, where Rob was working. 4. Yummy gluten-free meringues the the house of friends. 5. The market gardens on the banks of the Niger. 6. Getting close to the locals on a Sotrama. 7. A trip on a Malian train – not bad at all! 8. Driving the Mitsubishi on rough dirt roads to give Rob a break. 9. A visit to the amazing Dogon Country. Wow – all that and more in just three weeks! Such fun! Clive is a seasoned globe-trotter and also came to Benin for Christmas 3 years ago (proof here) although we know him from England (see here). Hope you’re enjoying the cooler British weather again now, mate! !